"TO THE MEMORY OF JOHN PORTEOUS ESQ. WHO DIED ON THE 9TH AUGUST 1842 AGED 42 YEARS"
Merchant and agent. Partner in the firm Oswald and Company. Porteous was a partner in the firm Oswald and Co. [ later Oswald, Seal and Co.], merchants and brokers. "He held a stake in the firm Oswald, Seal and Company, in Calcutta and after his death his possessions worth Rupees 60,000, were shared among the native 'celebrity' entrepreneur Babu Mutty Lall Seal (or Motilal Sil), of Colootollah, and William Trew (sic). 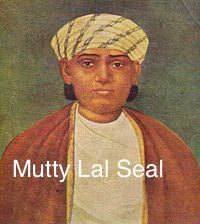 Mutty lall Seal was somewhat the principal figure behind Oswald, Seal & Co. and made a name for himself as a banker and money-lender, in Calcutta. Mutty Lall was born in a family of cloth merchants and started off by selling bottles and corks, mainly to one Mr. Hudson, who was the biggest importer of beer in Calcutta back then. A year later he was the 'bania' of Mr. Smith of the Strand flour mill and soon started investing in industries like indigo, sugar and saltpetre. After the agency house crisis of the 1830s, he started working with Europeans as partners and laid the foundation of Oswald, Seal and Company. Dipesh Chakrabarty, 'The Colonial context of the Bengal Renaissance: A Note On Early Railway Thinking In Bengal,' in Indian Economic and Social History Review, Vol. XI, No. 1, March 1974.)" James Charles, Snr. Minister, St. Andrew's Church.